Travel and work – it certainly can have a negative impact on my beer drinking! It is not all bad, I am in California for work and I have my weekends free. I was in Carpenteria last weekend, a nice beach town between Ventura and Santa Barbara. I am not much for laying on the beach and picking up the color of a well boiled lobster so my daughter Lisa and I walked down to the Island Brewing Company. It is a nice little brewery and tap room next to the tracks and near the Amtrak station. This isn’t my first rodeo nor my first visit to this brewery. 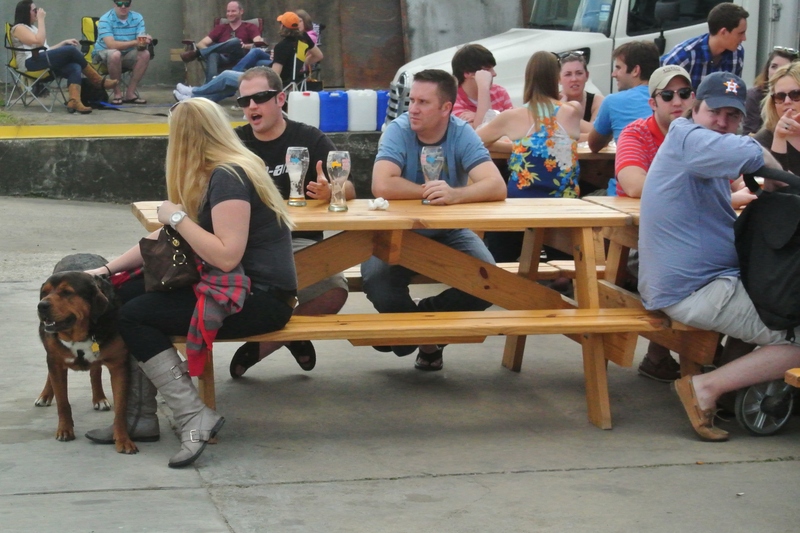 They have a very nice selection of beers, a casual and comfortable taproom and an outside seating area. Oh yes, the prices are very reasonable!!!! They also bottle the beers as well as sell growlers. 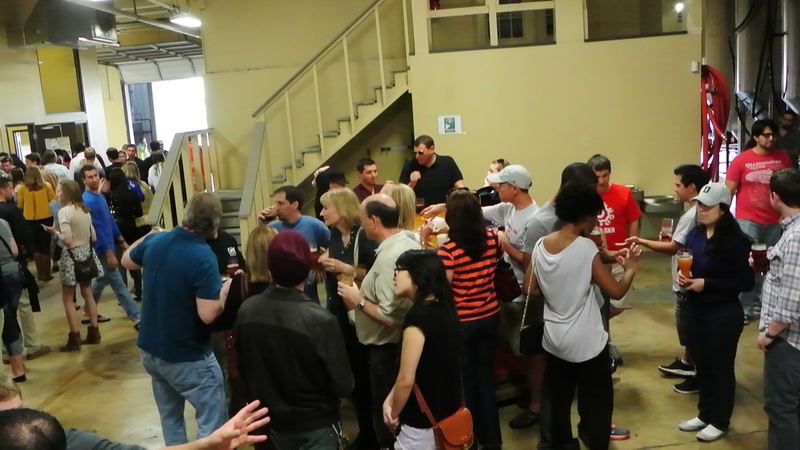 The timing was right and the brewery was hosting a tour of the back brewing area. The owner’s daughter was giving the tour. She is very knowledgeable and easy to talk to. While in the taproom I enjoyed the Paradise Ale, a pint of the cask ale – a raspberry wheat beer – a bit sweet but still very tasty and the Jubilee Ale! Not a bad beer in the bunch. 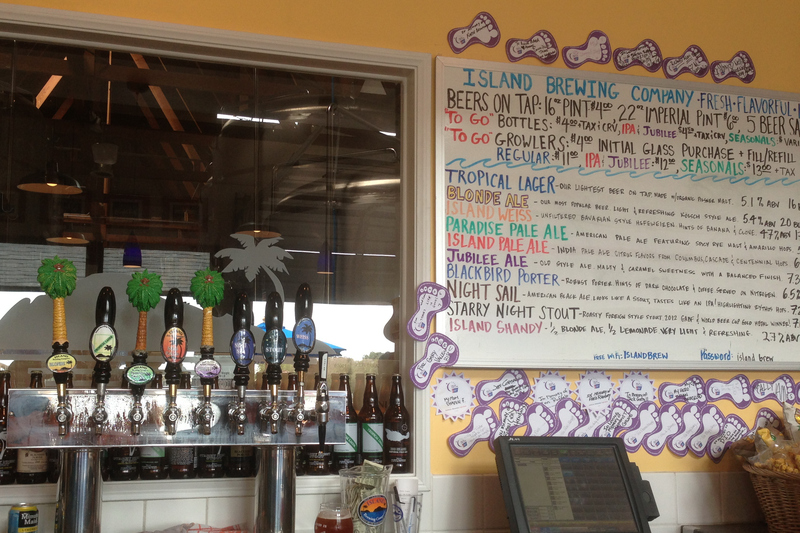 Lisa tried the Blonde, the Paradise and a Shandy – half Tropical Lager and Lemonade. I have sampled their Blackbird Porter in the past….a very tasty beer but better suited for the last beer of the evening while sitting at home! It is a wonderful beer! 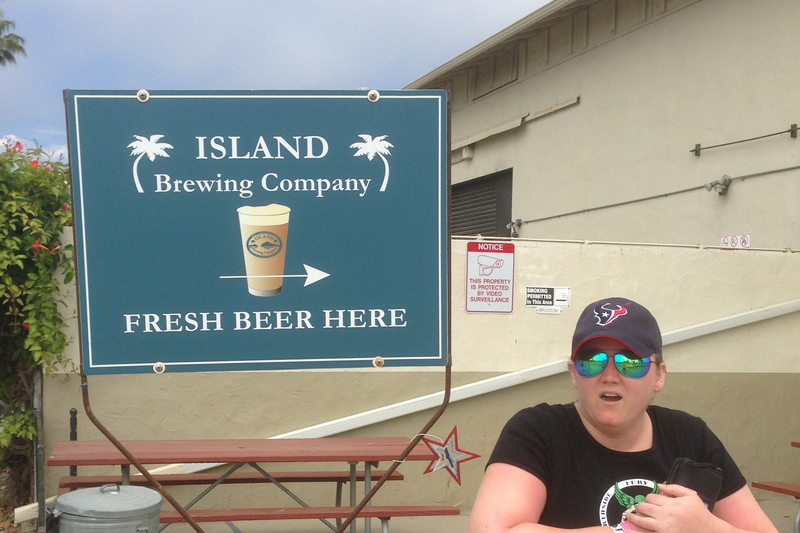 Lisa says – head this way to find fresh beer. Here is the tap room….. The taps and yummy board! On the walk back to the beach I had to make a pit stop. The picture is a little blurry….iPhones aren’t bad but you have to look close at this one to see the details. Down near the beach I stepped into the State park lavatory . 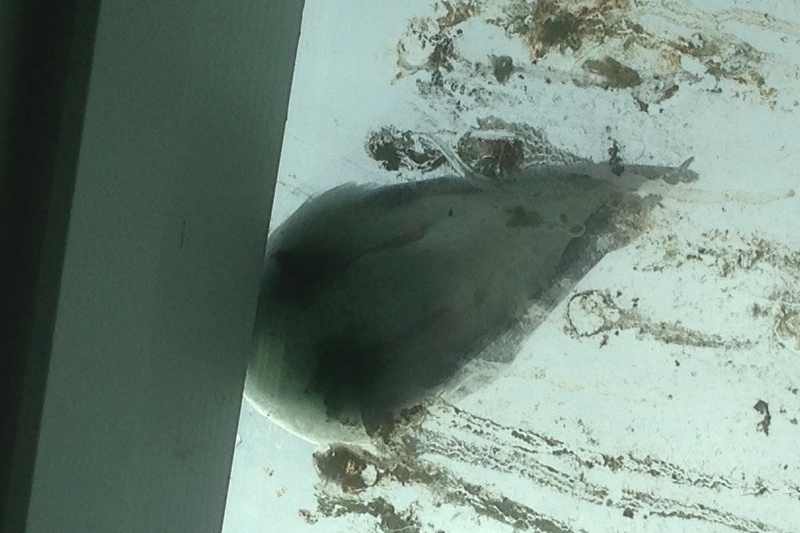 While standing there killing time I looked up and saw a frustrated sea gull – lost opportunity to bomb me! I hope to have time to visit Anacapa Brewing in Ventura, or Firestone in Paso Robles and if time permits San Luis Brewing in San Luis Obispo. 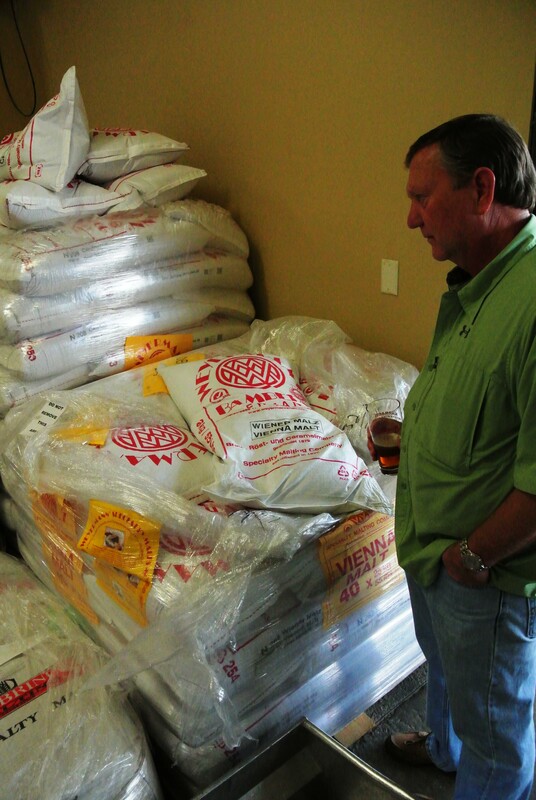 Bakersfield even has beer, yes I know that might surprise you….Lengthwise is my favorite pub and brewery in town. I hope to share a little more over the next week on my California adventures. Sorry for the delay in getting out this post. Life sometimes throws some lemons your way and even with the best intentions to make lemonade, life gets a bit overwhelming! An old saying that I picked up in Texas, I’m sure it is used elsewhere, is to realize that “This too shall pass!” And, yes it does but sometimes the pace of the passing is painfully slow. I do need to remind myself that I can look in the forward direction and influence what is yet to happen! About the tour……My good friend John tagged along with me – We were really pleasantly surprised, surprised in several ways. The crowd was so much larger than I had expected…see slide show below. The atmosphere was like a festival, games, food, scenery, interesting people and obvious enjoyment of the day. 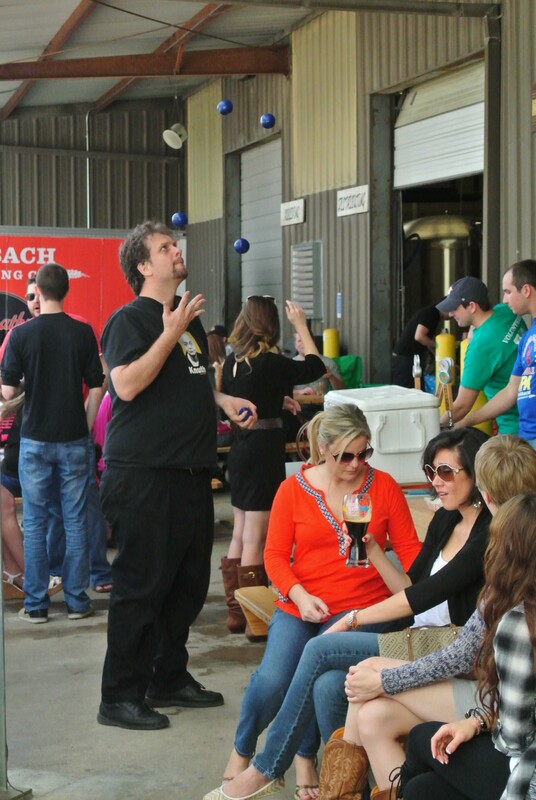 The beer was not much of a surprise, I have enjoyed Karbach offerings for quite some time. A little over a year ago I sampled the Hopadillo and Sympathy For The Lager at a pub down on Richmond. I am an IPA fan and the Hopadillo was added to my list of favorites. I bought the Tshirt……should have listened to my buddy….If I spend a few more hours( the number may actually exceed the several hundred figure), in the gym I think I could look good in it! 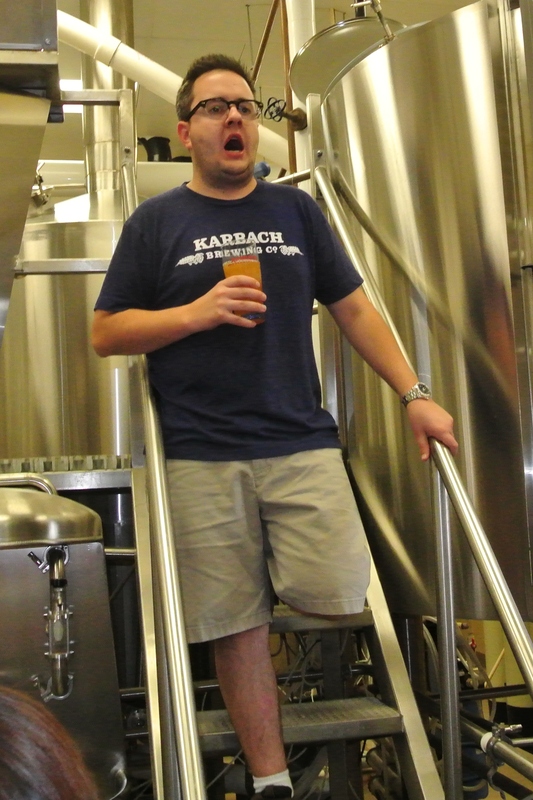 Dave Graham – a marketing guy gave the tour that John and I went through – 90+ % of the crowd was there to sample, soak in the atmosphere and sample the brews, thank goodness – otherwise the tour portion would have been exceptionally tight! 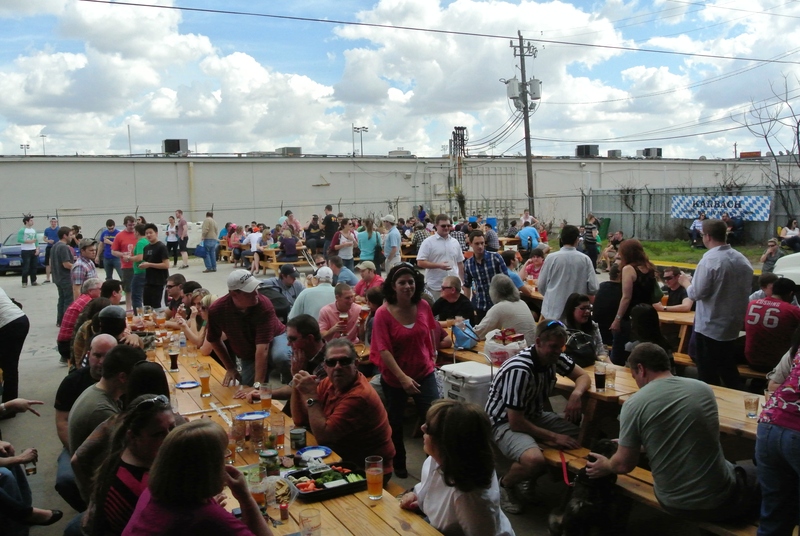 Take a look, plan a visit or look for the beer on the local Houston area shelves. I sampled the Pontificator, Weekend Warrior(nice smooth beer), the Hopadillo and the Weisse Versa Wheat. I believe John had the Rodeo Clown, Weisse Versa Wheat and the Weekend Warrior. He had one token left over and gave it up to the gal that worked the mobile catering truck – brisk business and ran out of food early – must have been good. She looked like she needed a good beer. Check the weather, gather up some friends and enjoy a nice outing. Karbach color coordinated single speeds. How cool is that! 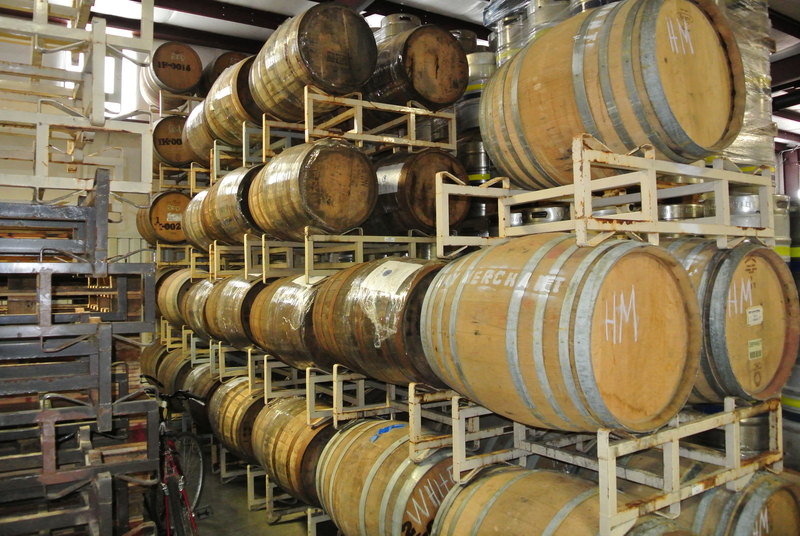 Yummy stuff maturing and developing flavors – wine barrels and bourbon barrels…can’t hardly wait! Dave doing a couple of things that he does well, speak to the crowd and quaff a cold one! My favorite brew in the bean bag version. Some more of the crowd – I can do that – Yeah Right! The thirty I refer to is not a place on the clock, it is a reference to 30 years married to my best friend and wife Kathy as of yesterday – 10/2/1982-10/2/2012. Yes, beer was part of the celebratory events! I asked Kathy to trust me and take a ride down town around 2:00 PM. Good sport that she is, she trusted me! Headed south on Highway 59, exited at Collingsworth, drove about a mile and half on the access road to Lyons Ave. 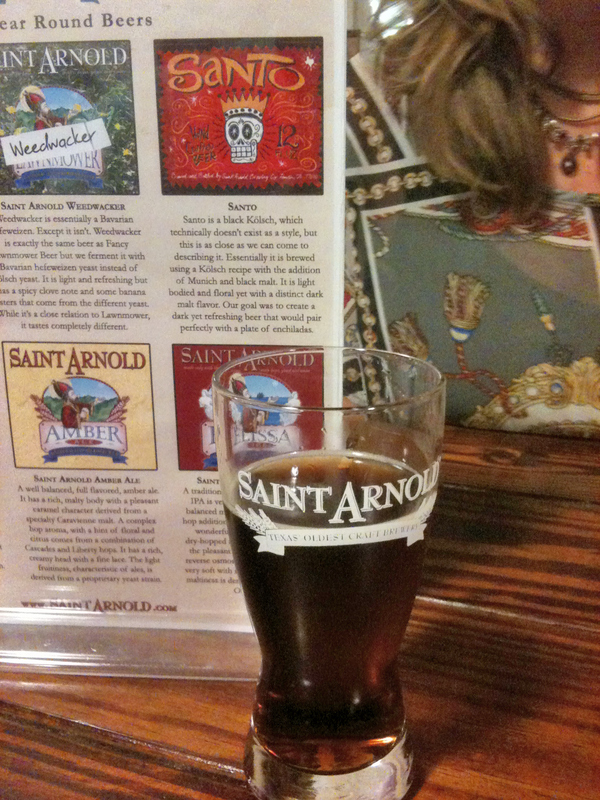 Turned right and she became very curious….a bit of blight was visible…beat up, old and abandoned buildings, industrial weed growth everywhere… The road took a jog and around the bend and then she spotted the destination, Saint Arnold’s Brewery! Now, before you think I am totally low brow, we returned home, gussied up and had a nice dinner that evening at a nice Italian Ristorante! 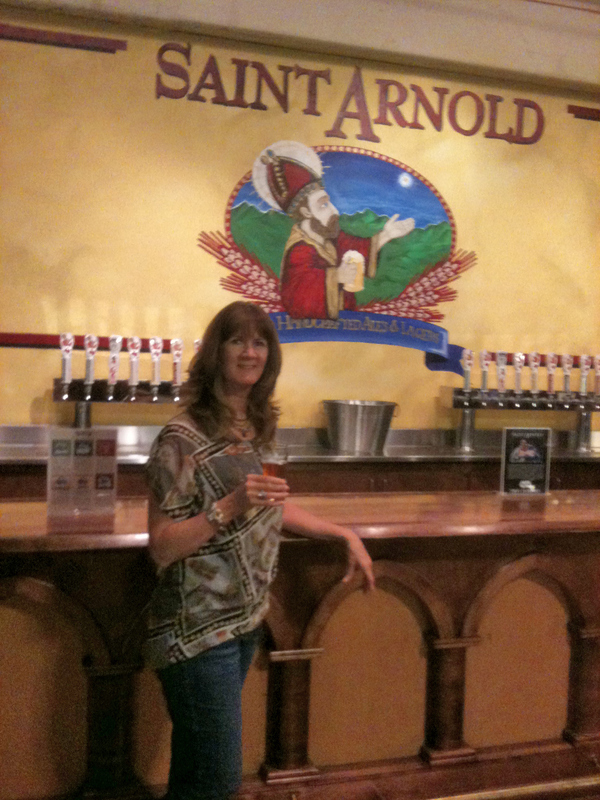 I have been wanting to see the St. Arnold’s brewery and beer hall for a long time. 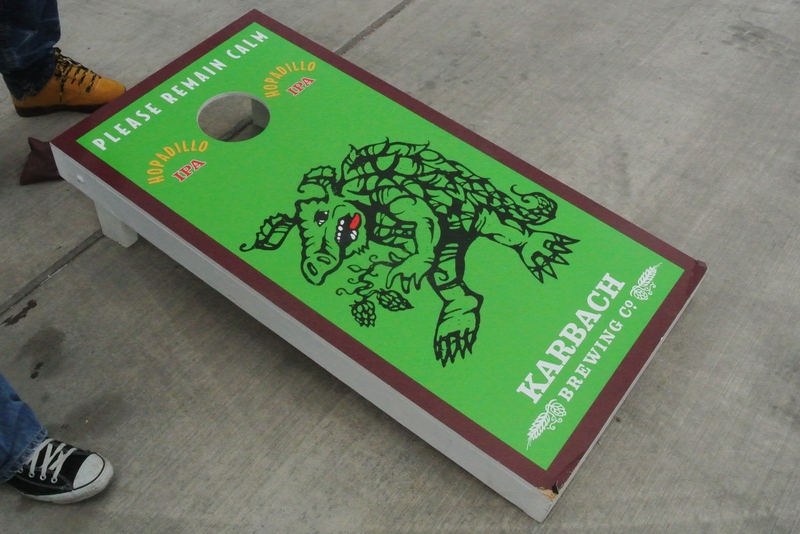 They make some very nice craft beers, in fact they call themselves the “oldest craft brewery in Texas”. I can’t and won’t dispute the claim….it’s not really that important. 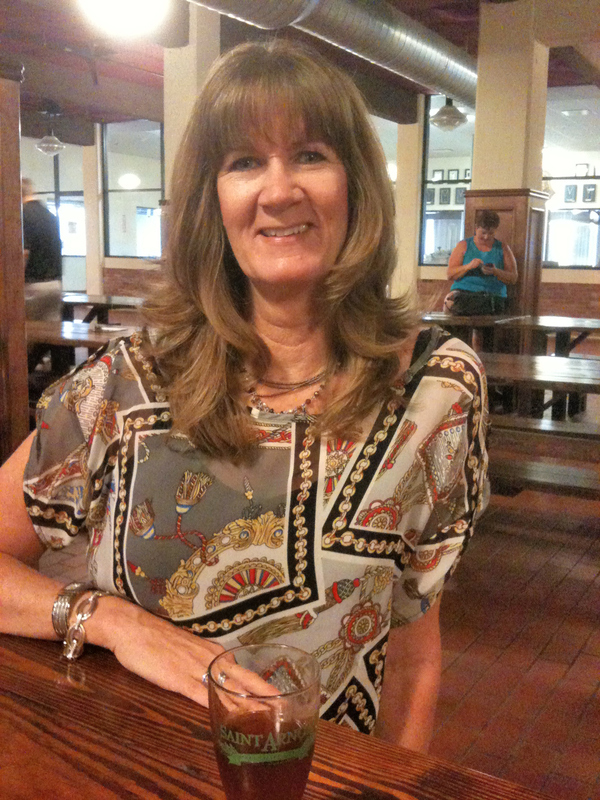 Kathy has been primarily a beer drinker ever since she turned – ahem! – 21! The photo below was cropped from a pre-ceremony wedding picture 30 years ago – just her hands holding a can of Coors Light. It may have been a little liquid courage to go through with the ceremony. Grainy shot holding a cold Coors Light. In my haste to get out the door and surprise Kathy – I forgot to bring a real camera, I did have my iPhone so we did chronicle the visit. I also forgot to have us wear closed toe shoes….safety requirement to participate in the downstairs portion of the tour. Santos, a black Kölsch style beer – still too malty for Kathy’s palate. I liked it! Our next choices in the cute little 10 ounce or so glasses were – the Amber for Kathy and the Endeavour for me. The Amber was easy on Kath’s palate so now we have something more to broaden our beer style horizons. The Endeavour is a Double IPA – way too hoppy for Kathy but the flavors made me very hoppy….ok, I know a little over the top in description. I liked it a bunch! Kathy enjoying one of the samplings. Kathy tried the Brown next and I think she was surprised at how nice it was! She finished with the Fancy Lawnmower which is a true German Kölsch style beer. I had to use two chips to get the Endeavour so I was limited to three small beers….. my last chip was for their standard IPA – The Elissa – less “amped” up on hops as compared to the Endeavour but I liked it! My lovely wife Kathy up at the counter… Happy 30th Hun! I encourage all y’all to drink local! We met a young couple in town from PA for some meetings. They work for EOG Resources and follow the “drink local” creed. On top of that the young lady also homebrews!!!!! Wow. 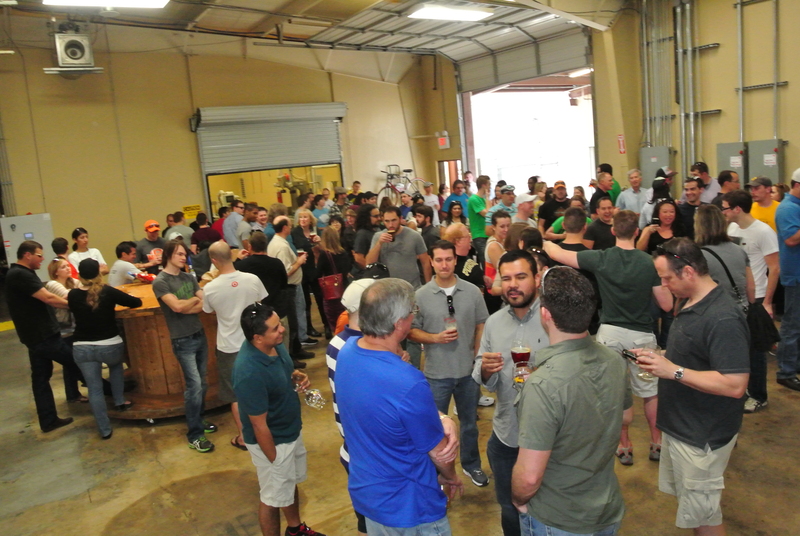 Saturday August 4th I organized a trip over to Conroe TX for a chance to tour the Southern Star Brewery over in Conroe and most importantly sample some of their beer. I had previously consumed the Bombshell Blonde Ale on several occasions and found it very drinkable – one that my wife finds enjoyable….she is slowly broadening her tastes away from yellow fizzzy water! “Toureess” on this very warm and humid day were the true fans of craft beer. 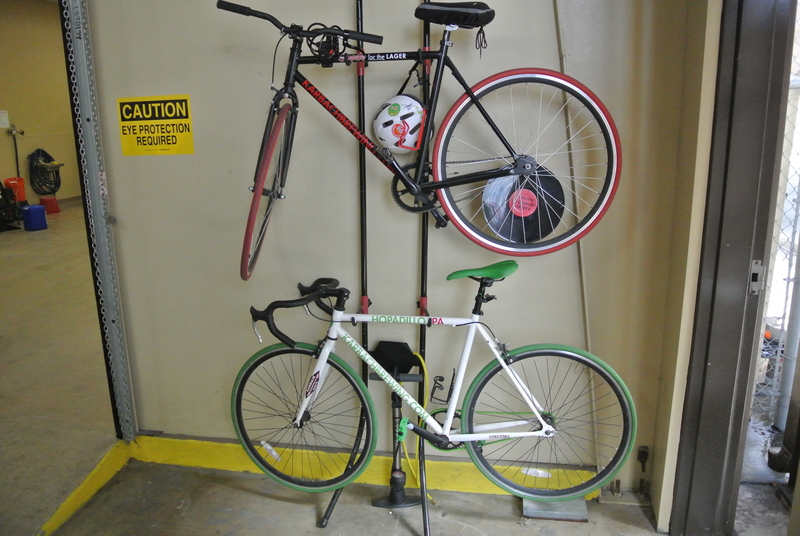 The brewery/warehouse is not airconditioned…..it would not be cost-effective! Big industrial fans stirred the air around to help! My son Ben, best friend John and his son Ryan were in our group attending the tour. A hint for those touring during the summer…dress appropriately – three of the four in our party wore those breathable fishing shirts – Columbia and Magellan brands – Ryan was Mr. T-shirt. Yes I sweated as did most everyone expended energy to lift the glass to their lips. The tour was awesome – The head-brewer was very knowledgeable, answered all of our beer geeky questions and I learned some valuable tips to incorporate into my home-brewing activities. The crowd was packed with home-brewrs…..a great sign! Although not in stores yet – the brewery’s new Pro-Am recipe is an Imperial Double IPA and it is awesome…. This is a great beer for IPA lovers. 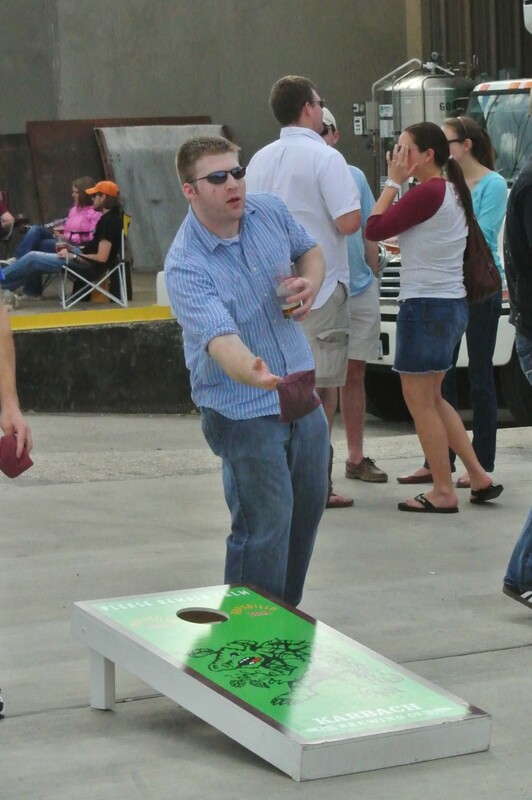 Bring your own lawn chair and misting fan if you want….The also serve up some killer beer brats as well as being some of the friendliest people you’ll ever meet. 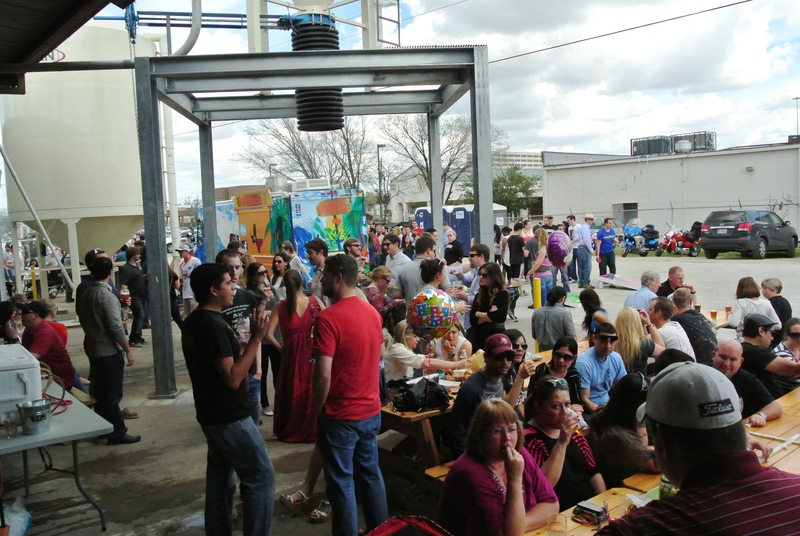 Drink and buy local – Houston has some great choices and Southern Star is a great choice….canned/kegged beer – they don’t bottle – cans are a better way to keep beer fresh and makes hauling them around easier….cans are much more easily recyclable! 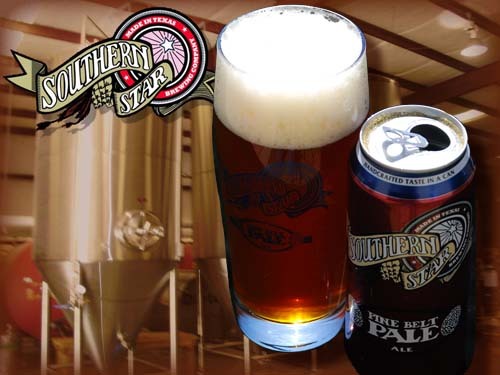 Southern Star Brewery – Pine Belt Pale Ale – Yummy!